Many times, the salad bar in the d-hall seems a bit lackluster. After looking at the same vegetable options each day, it often feels like there isn’t a single thing you could put on your greens to make them taste better. It is for this –and many other reasons– why sweet potato night is one of my favorite days of the week. Each perfectly browned cube holds the potential to make your salad the best one you’ve had all week. Not only are sweet potatoes a super-vegetable, packed with vitamin A and vitamin C, but they are also an oh-so-sweet source of fiber. 1.) 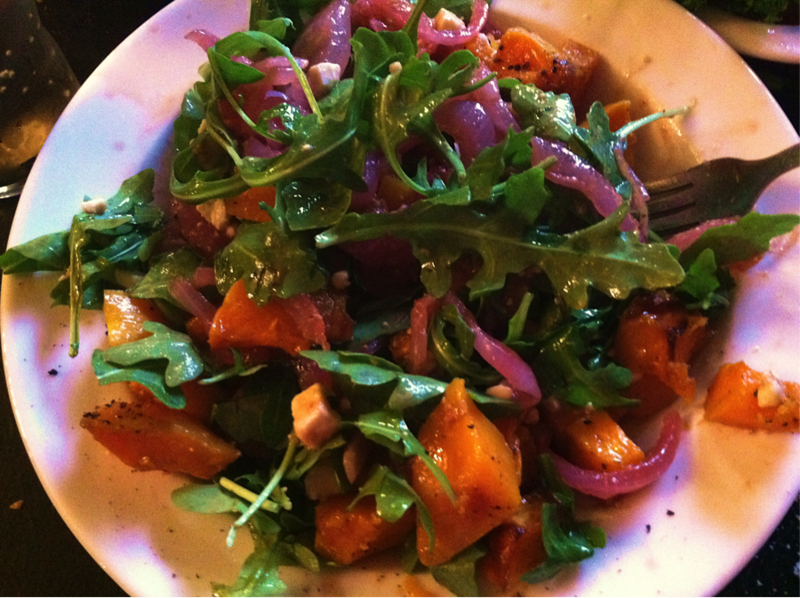 Take a large bowl, and fill it with arugula, sweet potatoes, feta and red onions. 2.) Season with olive oil and grounded black pepper. 3.) Grab another large bowl. Cover the salad with the bowl, and holding down the sides, gently toss the salad. Inspired by a recipe from the kitchen of Chef Diane Kochilas. Check out her website here: http://www.dianekochilas.com/.